Ladies first — this is the custom of the knights. Since all of us are in the concert hall — in ex-Methodist Church of the Maltese town of Floriana, — this knightly allusions can not be avoided. Therefore, let’s start with ladies, that is with an uncommon pianist Julia Zilberquit, who performed two Concerti Grossi for strings of Vivaldi / Bach’s own transcription for piano. Previously, both opuses originally were Concerti Grossi for the organ in Bach’s transcription, and then underwent secondary “treatment” — being quite in the spirit of the Baroque era, when composers, poets and writers sinned by quoting their and not only their works, which became only better after such “treatment”. Transcriptions of the transcriptions were a success. The first one, Concerto Grosso BWV 593 (RV 565) D minor, originally composed for two violins and cello, captured by its polyphony, gracefully distributed between the piano and the strings, an unmistakable understanding of Vivaldi’s style and the note-perfect taste. In the second Concerto A minor BWV 596 (RV 522), originally written for two violins and orchestra, the piano part flaunted with ornaments that would honor any Paramour — especially in the saddest middle part of Largo e spiccato. It is not surprising that Bach admired this music, its brilliant filigree, which echoes in his own concertos. American pianist native of Russia, Julia Zilberquit, a student of Bella Davidovich, is famous for her warm, soft sound and romantic interpretation of even the most “male” opuses. Her legato is great, she possesses the remarkable dramatic talent, sharp sense of form and, most interestingly, her performance is distinguished by its seriousness and lightness at the same time. As for the transcriptions, according to Julia, Vivaldi wrote many concertos for strings, completely ignoring the keyboard, so that she simply wanted to correct this historical injustice. And, of course, to expand the piano repertoire at the same time. 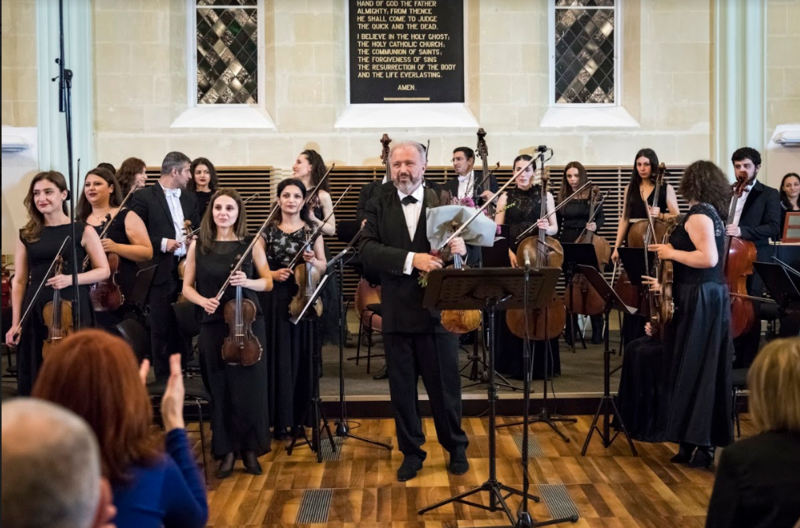 The soloist and string section of the Armenian State Symphony Orchestra were surprisingly unanimous — talented young musicians were not alien to beautiful impulses and romantic approach to music of both the red-haired Abbot of Venice, and the great Cantor of Leipzig. 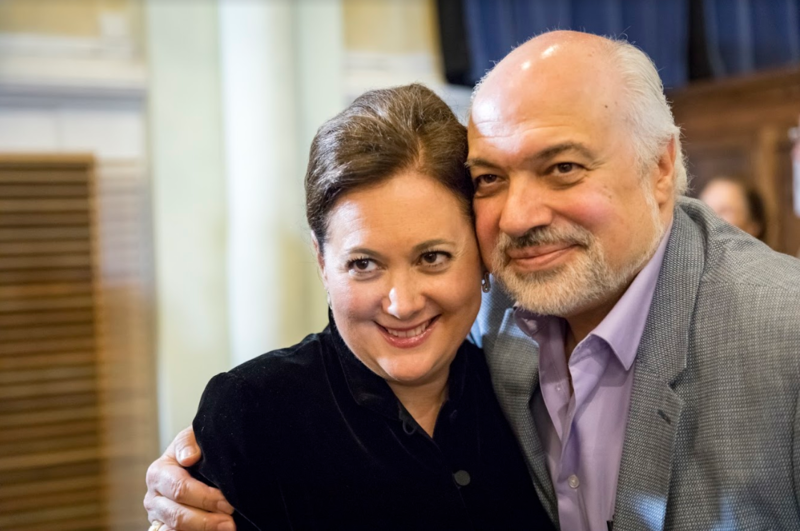 The whole process was led by Dmitry Sitkovetsky, a citizen of the world, a world-famous conductor and violinist (and also the son of Julia’s beloved teacher — Bella Davidovich), who was set on the same wave. 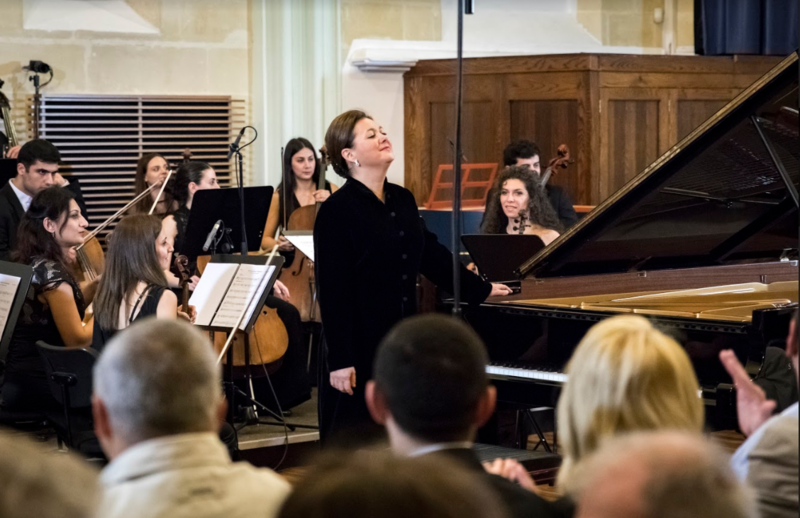 “Transcriptions may enliven, extend or begin a new life of a great or overlooked composition, — said Dmitry Sitkovetsky in his interview to the Maltese Herald magazine. — Now there is certain stagnation in music — people play the same works, and they do it unexcitingly. And art is intended to open up new colours. I find it boring to play the same pieces, that is why I began making transcriptions”. Yes, he is unanimous with Julia in this subject, and that’s what is amusing: the violinist Dmitry Sitkovetsky created, among other things, own transcriptions of keyboard works by Bach (including a three-part inventions and Goldberg variations) for string trio, that is made to reverse the process. Meanwhile, the concert was opened by the Ancient Airs and Dances of Ottorino Respighi. The fighter for arte di avangardia this time forgot about Art Nouveau and plunged into the arrangement of works for lute of the Italian Renaissance and early Baroque composers. So if you please, here you’ve got the transcriptions again, having in mind that most of the material Respighi borrowed from the Italian musicologist Oscar Chilesotti. Delicate, almost transparent orchestral colours were soothing to ears. Elegant passages reminded the reason why Ottorino Respighi is loved so much by choreographers. From here lays a straight road to the 21st century, proving that music is, as before, is innocent, in spite of external complexity. Actually, two paths led to “Four Seasons of Manhattan” for violin and string orchestra by Alexey Shor: Respighi — closer to him in time, and Vivaldi — closer to him in spirit who looked at the relations between the mankind and the Universe. Shor’s cycle also consists of four parts, starting but with “Summer” and ending with “Spring”. Summer in Manhattan is very hot (“my favorite season in new York — Indian summer”, said Dmitry Sitkovetsky at a press conference, meaning, as you know, to early autumn). As for Shor’s melodious music, the author conveyed his personal impressions of seasonal changes, although the idea behind his opus is different: if Vivaldi’s violin behaves as a separate solo instrument, Shor has it integrated into the orchestra, so the violin is an integral part of it. In a refined, emotional, inspired — in a word, masterful performance by Dmitry Sitkovetsky in two guises — violinist-soloist and conductor — Vivaldi’s “Seasons” sounded “raw”, as they are, however one could feel how the time flies. According to the musician, in the change of seasons there is a special attractive force, which inevitably affects the people involved in art by its allegorical nature (awakening, blossoming, fading and death). No wonder Sitkovetsky felt the meaning of the works of Vivaldi to the bottom, felt his intonation, simplicity and depth, which makes it con-temporary with any epoque, era or century. Do not forget that we are talking about the first four concerts of the collection “The Contest Between Harmony and Invention” inevitably reminiscent of the art of confrontation in the sublunary world. Ladies first — this rule was in acton for the the composition of the chamber section of the Armenian State Symphony Orchestra, where the very young charming girls clearly were leading. A few young men, however, perfectly blended in: the team sounded like a single organism, reverent, pure, pulsing. Never in my life I have had an opportunity to hear such a perfect bird trills in “Spring”, when the soloist Dmitry Sitkovetsky was joined by the first and second violin and in the same moment caused some insurmountable feeling of happiness, which remained for all four Vivaldi’s concerts-seasons — until the last bar line. The orchestra, led by Maestro Sitkovetsky, demonstrated refined nobility of manners, exquisite eloquence and theatricality, attracting skillfully executed effects and colorful sound recording. 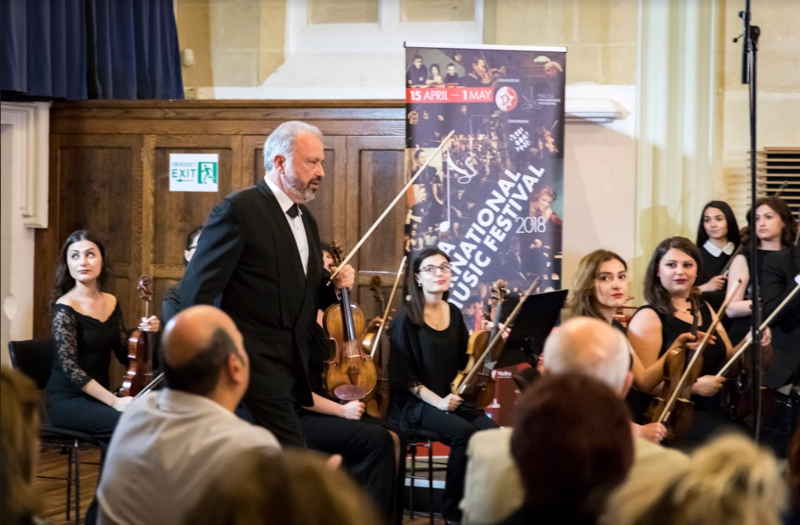 It was a true Baroque plot, where different voices of events took place simultaneously, entrusted to different instruments; the true Baroque beauty of clash, when the soloist and orchestra object to each other, and each of them only benefits from it.